Here's a link to a write-up the A3M event we were so lucky to be a part of. In case you don't want to click through, a copy of the actual piece runs below. A3M introduces marrow transplant recipients at annual gala. Ann Gregory (right), accompanied by her husband, Chris, was introduced to her bone marrow donor, Dana Lau, and her husband, Hung. When someone says, “You’re a lifesaver,” it’s usually a figure of speech. But when special guests said it at Asians for Miracle Marrow Matches’ (A3M) annual fundraising gala on Saturday at the Hyatt Regency Downtown Los Angeles, they really meant it. 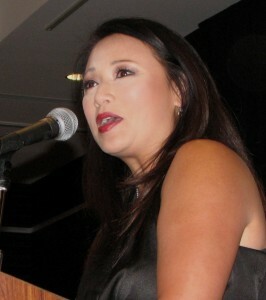 Emcee Denise Dador from ABC7 Eyewitness News. A3M is dedicated to finding bone marrow donors for Asian American patients with leukemia and other life-threatening blood diseases. A tissue match between donor and patient is needed for a successful transplant, and the best chance of finding a match is among family members or people of the same ethnic/racial background. “There’s a lot of things that have changed since the inception of A3M 22 years ago … Back in 1991 there were literally no Asians in the marrow registry,” said A3M Director Shin Ito. “If you were of Asian descent and you had leukemia and you needed a marrow transplant, you pretty much had no chance. A3M has a tradition of introducing patients to their donors during its annual gala, and this year was no exception. The patient was Ann Gregory, who is of English/Irish descent on her father’s side and Vietnamese/Chinese on her mother’s side. She was diagnosed in 2007 with acute lymphoblastic leukemia (ALL). In the absence of a suitable marrow donor, she had an umbilical cord blood transplant after a legal and media battle with her insurance company, which initially called the procedure experimental and refused to cover it. “I managed to stay in recovery for 13 months before a relapse … It bought me enough time for a donor to be found, and I’m just so grateful,” said Gregory, who was accompanied by her husband, Chris. The donor was Dana Lau, who registered 16 years ago during a marrow drive for 3-year-old Alana Dung in Hawaii. Lau was not a match for Alana, who later passed away, but 10 years later had another chance to save a life when she was identified as a near-match for Gregory. “The Hawaii Bone Marrow Registry team was so helpful and supportive in trying to accommodate my busy life of being a teacher, wife and mother … I remember the love and sometimes protective support of my family and close friends,” said Lau, who was accompanied by her husband, Hung. She also noted that in one case, a donor’s husband refused to let her go through with the procedure because he feared, incorrectly, that it would affect her ability to have children. Dador stressed the importance of clearing up misconceptions about marrow transplants. Dador has been honored by the National Marrow Donor Program for helping to promote A3M’s mission. 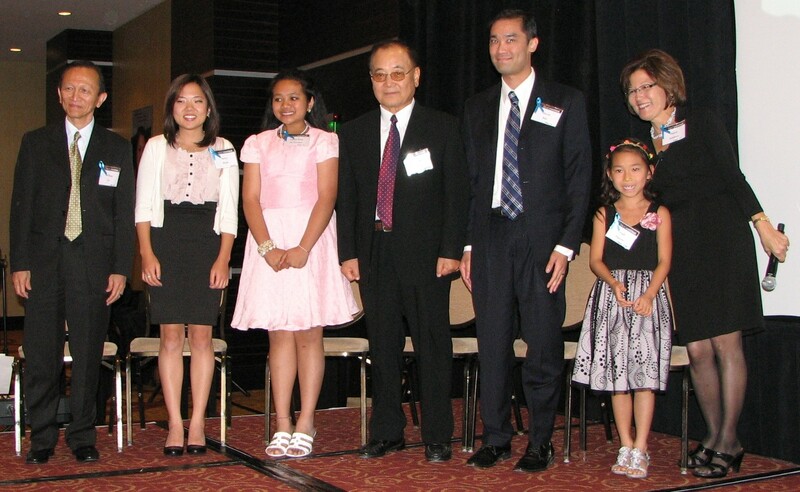 From left: Bone marrow recipients William Ko, Jenny Hirata, Celine DeGuzman, Seung Hong, David Bao, Kaili Nguyen and Nancy Sakakura. Dr. Ryotaro Nakamura of CIty of Hope has worked with A3M patients. • William Ko was diagnosed with chronic myelogenous leukemia (CML) at age 33. Roselle Espiritu was found to be a match and the transplant was done in 1994. Ko, who also survived a mild heart attack last year, has sons who are 20 and 23 years old. • Jenny Hirata was diagnosed with acute myelogenous leukemia (AML) at age 9. After chemotherapy and blood and platelet transfusions, the cancer returned. Cynthia Yamaguchi, who registered at a Krafty Delights craft fair, was found to be a match and the transplant took place in 1993. Hirata now performs with a taiko group and is pursuing a master’s degree in speech therapy at CSU Northridge. • Seung Hong was diagnosed with CML in 1999. A donor was found through A3M, but the man had a medical condition that did not allow him to undergo the procedure. After his condition progressed to AML, another match was found and the transplant was done in 2000. As a result, he was able to celebrate his 60thbirthday, walk down the aisle with his daughter, and spend time with his four grandchildren. • Celine DeGuzman was found to be suffering from aplastic anemia when she was only 8 months old. Luckily, she found a donor in Hawaii in less than six months. Thirteen years later, she is attending junior high school and wants to become a nurse. She met her donor for the first time at an A3M event. • Christine Pechera was given only a month to live when she was diagnosed with cancer. After enduring high-dose chemotherapy, full-body radiation and a bone marrow transplant, she suffered a relapse and had to find another donor. Eleven years after her diagnosis, she is happily married and graduating from Pepperdine University with a master’s degree. She also was introduced to her donor at an A3M event. Due to an auto accident, she was unable to attend this year’s gala. • David Bao, a husband and father, was diagnosed with ALL in 2009 and underwent chemotherapy. He found a match through the Tzu Chi Registry and had his transplant that same year. Last month, he was able to meet his donor in Taiwan. “The trip out there took 31 hours … I had an opportunity to talk to my donor for about 20 minutes … It was truly worth it. She’s an angel,” he said. 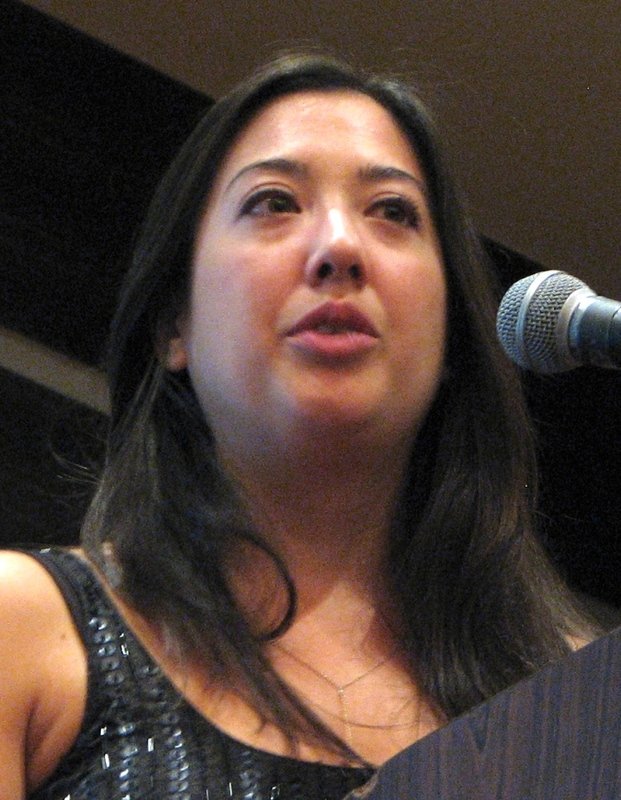 • Kaili Nguyen was diagnosed with MDS at age 3. After several cycles of chemotherapy, she found a match through A3M. She suffered a relapse a few months after the transplant, and the doctor gave her more of the donor’s stem cells. Three years later, she is a second-grader who wants to be a pediatrician. She and her donor recently took a trip to San Francisco. Sakakura also introduced “gifted, amazing, committed doctors” from City of Hope who have treated A3M patients: Auayporn Nademanee, Ryotaro Nakamura, Pablo Parker and Chatchada Karanes. 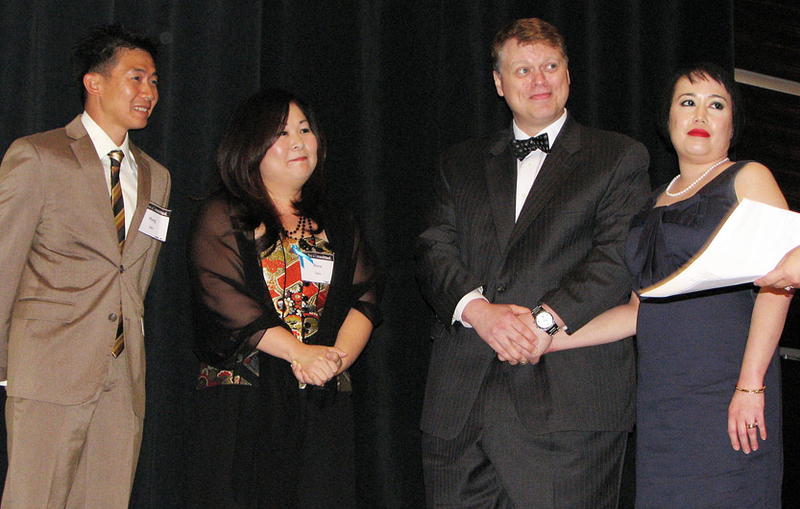 From left: Gene Kanamori, event co-chair; representing the Dale M. Inouye Foundation, Shannon Kitani (for Harvey Kitani), Randy Kiehm, Scott Mibu and Cathie Tani; A3M Director Shin Ito. The Human Spirit Award was presented to the founders of the Dale M. Inouye (DMI) Foundation: Randy Kiehm, Harvey Kitani (represented by his wife, Shannon), Scott Mibu and Cathie Tani. 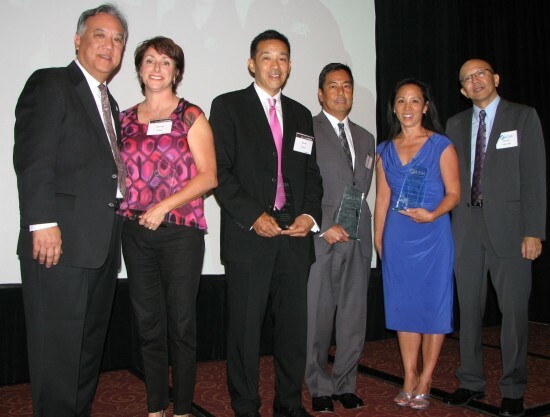 Established in memory of Dale Inouye, who died of leukemia in 2008 at the age of 9, the foundation raises funds for cancer care and cancer research through a youth basketball tournament and a golf tournament, and collaborates with A3M in conducting donor registration drives. Krissy Kobata is both an A3M volunteer and a patient. “I for one truly believe that Dale’s life and his passing were meant to inspire others. Julianne Inouye, Dale’s mom, would tell a story that got me thinking and led me to believe this. She would say at some point in Dale’s life he became aware of his fate and he had this conversation with his mom. He asked his mom to not forget him, and he asked his mom to not let others forget him. 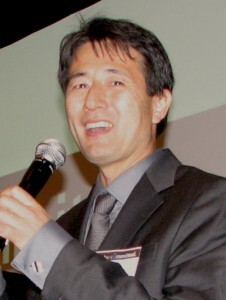 Other speakers included Gene Kanamori, who co-chaired the event with his wife, Vickie. Entertainment was provided by singer Keiko Kawashima and pianist Scott Nagatani from the Grateful Crane Ensemble. The program also included a silent auction, a marrow donor drive, and a raffle drawing with two round-trip, first-class tickets from American Airlines (represented by Nancy Matsui) as the grand prize. Last week, Ann and I travelled to Los Angeles at the invitation of Asians for Miracle Marrow Matches (A3M) to meet Ann's donor at a gala event. In the last post I said that this feels more like an ending of sorts. But, apart from that rather vague description exactly where does one start in describing, let alone summing up the finale to what has been the most life changing episode in our lives? To avoid breaking with tradition, I'll start with last Friday. We boarded a flight from Baton Rouge to Houston and then to LA. Both of us nervous and a little giddy at what was coming up. We had known about the A3M event for several weeks and had avoided saying anything about it on the blog, because anything can happen. Exhibit one to this is Ann's latest bout with GVHD and pneumonia which landed her in the hospital. Right after that was the "5 Year" visit, the one where you're supposed to get the "golden handshake"; the one where the doctor says, "you look great" and "thanks for coming in", or most importantly "you survived / beat the odds / are cured" or some combination of words that equates to those sentiments. Ergo, posting that we were poised to take a "victory lap" with so many plates spinning seemed like tempting fate. So last Friday, we boarded a flight from Baton Rouge to Los Angeles by way of Houston. The trip was anticlimactic to say the least. Modern air travel is only palatable because of the mass adoption of the smart phone and audio and video compression algorithms. 5 fours later and 2 hours ahead of what time we were used to, we arrived at LAX. We were collected at baggage claim by Ahn Nguyen and her husband Ted (from A3M). As it turns out they were there not just to meet us but also to prevent us from accidentally bumping into Ann's donor and family who were flying the same airline from a different destintion and only about 10 minutes behind us. We were clueless as to the subterfuge, and just ready get our bags, and go. Ann was suffering the effects of jet-lag at this point much worse than I was. So after a great dinner and a brief tour of the city, we checked into out hotel room and almost collapsed. The next day, the big event was scheduled for the evening, which left us most of the day to mess around. We did a little walking around downtown LA before Ann started worrying about her breathing. That sent us back to the hotel, but not before seeing most of downtown LA barricaded off by private security and teamsters who were there apparently to shoot a Kia Soul commercial. The film crews, cameras and Mercedes fitted out with steady cams were neat to look at - the day glow safety orange Kia...no so much. Once back at the hotel we started getting ready for the big night. Remember what it felt like to go out on a first date? Or junior Prom? Yeah - that picture just about sums it up. Nervous was the secret word of the day. Ann and I had joked several times about what would happen if we met her donor and she didn't like us. All joking aside, meeting Ann's donor wasn't just a very real possibility. In a matter of about three hours, it was a certainty. Don't think the thought of breaking my leg and having to go to the hospital didn't occur to me - it did. Before we could flee, and spare the world from what unwholesome despicable people we were, Anh turned up at our room and ushered us down to the silent auction A3M was holding. We arrived and ran into Nancy Sakakura! Long time readers of the blog will recognize Nancy as one of the people who comments most frequently and our history and friendship goes all the way back to the darkest days of 2007. Nancy was the 1st patient I ever reached to out who responded. She gave Ann and me such hope that the odds could be beaten, bone marrow transplants could be survived and life could begin to "look" normal once again. Nancy and her blog about her transplant at City of Hope gave us a road map of what treatment, transplant, engraftment and recovery would look like. I will be forever grateful to her for taking the time to share with us, because without her friendship everything would have been so much darker. OK, so this is a good place to draw Part 1 to a close. Next update we have the event and meeting two of the most genuine and precious people in the world. It has been a long time since I blogged and I must apologize for my protracted absence. I am really excited that we will be able to share some really important news with you soon. I don't mean to tease but there are a few "i"s to dot and "t"s to cross before it goes out.